Description: Medium intense ruby colour with a garnet shimmer. Still somewhat closed, clean uplifted varietal aroma: impressions of red berry fruit, cherries along with oak spice (white pepper, cinnamon). Quite pronounced flavour, medium bodied. Fresh finish with good length and a presence of spicy tannin. Elegant style. Suggested Food: White and red meat, poultry, duck, venison, cheeses. "Wine Spectator" has rated the wine "Alois Lageder Tenutae Lageder 'Krafuss' Pinot Noir Alto Adige, Trentino-Alto Adige, Italy" from the vintage 2012 on 28.02.2017 with 90 of 100 points. "Wine & Spirits Magazine" has rated the wine "Alois Lageder Tenutae Lageder 'Krafuss' Pinot Noir Alto Adige, Trentino-Alto Adige, Italy" from the vintage 2012 on 01.10.2016 with 88 of 100 points. "Falstaff Magazin" has rated the wine "Alois Lageder Tenutae Lageder 'Krafuss' Pinot Noir Alto Adige, Trentino-Alto Adige, Italy" from the vintage 2012 on 06.07.2016 with 90 of 100 points. "Wine Spectator" has rated the wine "Alois Lageder Tenutae Lageder 'Krafuss' Pinot Noir Alto Adige, Trentino-Alto Adige, Italy" from the vintage 2010 on 29.02.2016 with 91 of 100 points. "Wine & Spirits Magazine" has rated the wine "Alois Lageder Tenutae Lageder 'Krafuss' Pinot Noir Alto Adige, Trentino-Alto Adige, Italy" from the vintage 2010 on 01.08.2015 with 89 of 100 points. "Falstaff Magazin" has rated the wine "Alois Lageder Tenutae Lageder 'Krafuss' Pinot Noir Alto Adige, Trentino-Alto Adige, Italy" from the vintage 2011 on 23.06.2015 with 89 of 100 points. "Falstaff Magazin" has rated the wine "Alois Lageder Tenutae Lageder 'Krafuss' Pinot Noir Alto Adige, Trentino-Alto Adige, Italy" from the vintage 2010 on 25.06.2013 with 90 of 100 points. "Falstaff Magazin" has rated the wine "Alois Lageder Tenutae Lageder 'Krafuss' Pinot Noir Alto Adige, Trentino-Alto Adige, Italy" from the vintage 2009 on 11.07.2012 with 92 of 100 points. "Falstaff Magazin" has rated the wine "Alois Lageder Tenutae Lageder 'Krafuss' Pinot Noir Alto Adige, Trentino-Alto Adige, Italy" from the vintage 2004 on 30.05.2012 with 94 of 100 points. "Wine Enthusiast" has rated the wine "Alois Lageder Tenutae Lageder 'Krafuss' Pinot Noir Alto Adige, Trentino-Alto Adige, Italy" from the vintage 2006 on 07.01.2012 with 91 of 100 points. "Wine Enthusiast" has rated the wine "Alois Lageder Tenutae Lageder 'Krafuss' Pinot Noir Alto Adige, Trentino-Alto Adige, Italy" from the vintage 2008 on 07.01.2012 with 91 of 100 points. "Wine Spectator" has rated the wine "Alois Lageder Tenutae Lageder 'Krafuss' Pinot Noir Alto Adige, Trentino-Alto Adige, Italy" from the vintage 2007 on 31.08.2011 with 90 of 100 points. 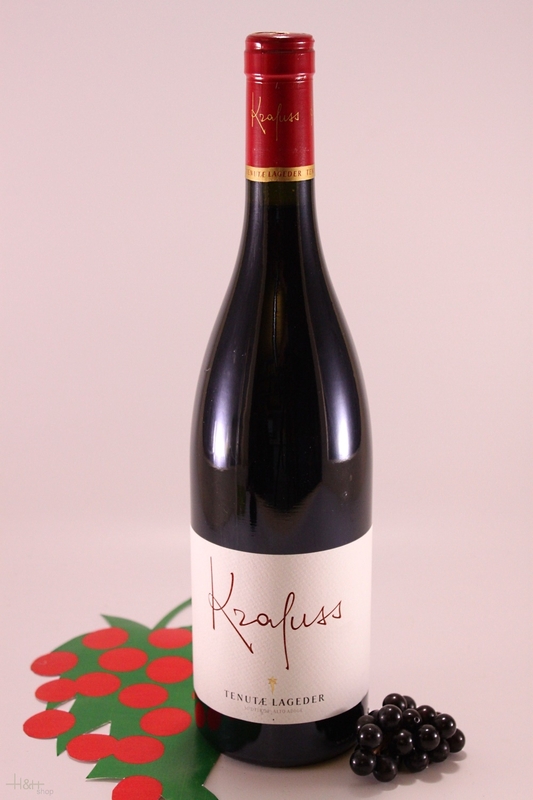 "Falstaff Magazin" has rated the wine "Alois Lageder Tenutae Lageder 'Krafuss' Pinot Noir Alto Adige, Trentino-Alto Adige, Italy" from the vintage 2008 on 13.07.2011 with 89 of 100 points. "Wine Enthusiast" has rated the wine "Alois Lageder Tenutae Lageder 'Krafuss' Pinot Noir Alto Adige, Trentino-Alto Adige, Italy" from the vintage 2005 on 11.01.2011 with 92 of 100 points. 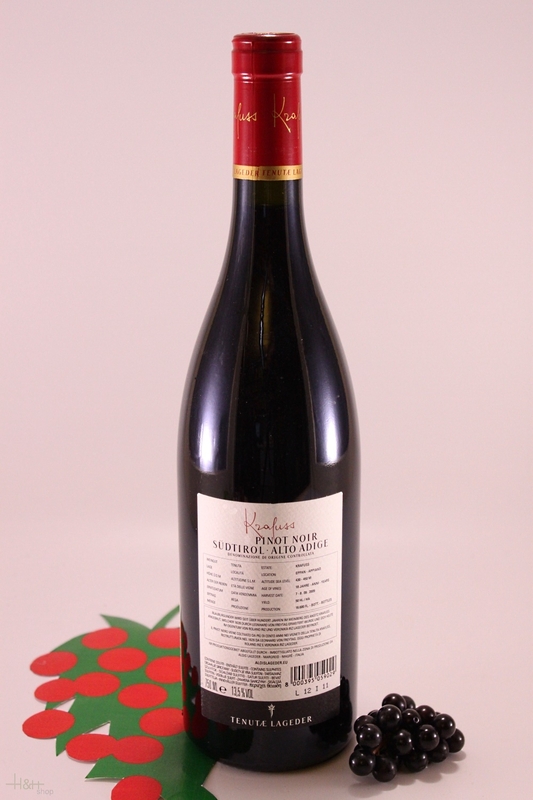 "Falstaff Magazin" has rated the wine "Alois Lageder Tenutae Lageder 'Krafuss' Pinot Noir Alto Adige, Trentino-Alto Adige, Italy" from the vintage 2007 on 08.07.2010 with 89 of 100 points. "Vinous Antonio Galloni" has rated the wine "Alois Lageder Tenutae Lageder 'Krafuss' Pinot Noir Alto Adige, Trentino-Alto Adige, Italy" from the vintage 2006 on 01.10.2009 with 88 of 100 points. "Vinous Antonio Galloni" has rated the wine "Alois Lageder Tenutae Lageder 'Krafuss' Pinot Noir Alto Adige, Trentino-Alto Adige, Italy" from the vintage 2005 on 01.10.2008 with 90 of 100 points. "Wine Spectator" has rated the wine "Alois Lageder Tenutae Lageder 'Krafuss' Pinot Noir Alto Adige, Trentino-Alto Adige, Italy" from the vintage 2004 on 30.06.2008 with 87 of 100 points. "Wine Enthusiast" has rated the wine "Alois Lageder Tenutae Lageder 'Krafuss' Pinot Noir Alto Adige, Trentino-Alto Adige, Italy" from the vintage 2003 on 09.01.2007 with 89 of 100 points. "Wine Spectator" has rated the wine "Alois Lageder Tenutae Lageder 'Krafuss' Pinot Noir Alto Adige, Trentino-Alto Adige, Italy" from the vintage 2000 on 15.06.2004 with 87 of 100 points.